Nikolai Andrianov (full name Nikolai Yefimovich Andrianov) was born October 14, 1952 and died on March 21, 2011. He was born and also died inÂ the city of Vladimir in the Russian Federation. Â He was a famous Soviet male gymnast who, between 1971 and 1980, won many international gymnastics competitions, including the Olympic Games, the Gymnastics World Championships and the European Gymnastics Championships. Â Until 2008, he held the record for men for the most Olympic medals in any sport, winning a total of 15 including seven Olympic gold medals, five silver medals and three bronze medals. Nikolai Andrianov was married to World Champion team member and two-time Olympic gymnastics team gold medalist Lyubov Burda. Â The two originally met at the 1969 Junior Spartakiade. Â Their first son, Seryozha (Sergei) was born in 1975. Â They also had a second son, Dmitri, who Nikolai later coached in gymnastics. Andrianov was reportedly rescued from a wayward childhood when his best friend persuaded him to accompany him to gymnastics school. 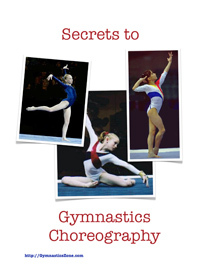 Nikolai Andrianov began gymnastics training at age 11 in Vladimir, Russia coached by Nikolai Tolkachyov. He set a number of gymnastics medal winning records. Andrianov’s first (and second) international gold medals came at the 1971 European Championships in Madrid. He won his first Olympic gold medal on floor exercise at the 1972 Munich Olympics. In the 1976 Olympics gymnastics competition in Montreal, Quebec, Canada, he won four Olympic gold medals, including the All-Around, floor exercises, rings, and vault. In that same Olympics he also won two silvers, and a bronze. 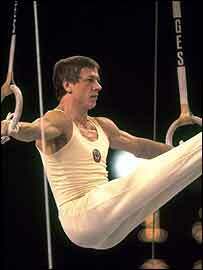 His 1976 record of four Olympic gymnastic gold medals at one Olympics was not surpassed until 1992 when Vitaly Scherbo won six Olympic gymnastic gold medals. Nikolai Andrianov won two golds, two silvers, and a bronze in the split 1980 Olympic games in Moscow. He retired in the year after those Moscow Olympics and in 2002 went on to replace his old coach, Tolkachev, as coach at the N.G. Tolkachyov Youth Sports School inÂ Vladimir where he first trained in gymnasticsÂ and also helped in coaching successful Russian gymnasts including Olympic gold medalists, Alexei Nemov and Vladimir Artemov. 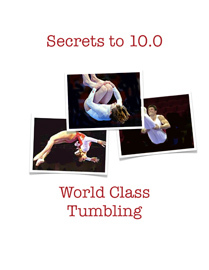 In 2001, Nikolai Andrianov was inducted into the International Gymnastics Hall of Fame. Andrianov developed multiple system atrophy, a degenerative neurological disorder called and was paralyzed in his final months, not able to talk or move his arms and. Nikolai Andrianov died on March 21, 2011 at the age of 58, in his hometown of Vladimir, Russia.